While a person's shape can be affected by pancakes, especially if you eat too many, you may not expect the same to be true on a cosmic scale. As it turns out, at least for the Circinus spiral galaxy, a pancake can shape an entire galactic nucleus. Astronomer Lincoln Greenhill (Harvard-Smithsonian Center for Astrophysics) and colleagues have found direct evidence for a "pancake" of gas and dust at the center of Circinus -- a thin, warped disk surrounding the galaxy's central, supermassive black hole. That disk shapes the galaxy's nucleus. It shadows different regions from the "glare" of the black hole, a glare created by the glow of accreting gas. And when some of this material is blown away from the black hole, as by radiation, the disk channels it, leaving shadowed regions in relative peace. This idea stands in contrast to the prevailing wisdom that shadows and outflows are caused by vast, thick "doughnuts" of dust and gas. "We caught the Circinus galaxy and its black hole red-handed," said Greenhill. "Most astronomers think that the center of an active galaxy has an outflow directed and channeled by a doughnut-shaped torus of dust and gas. Our detailed radio images show that the culprit is a warped disk. And if that's true for the Circinus galaxy, then the same may be true for other active galaxies." Greenhill and his fellow astronomers identified the disk using the Australia Telescope Long Baseline Array, which is a network of radio telescopes 600 miles across. Only radio imaging can reveal directly such tiny structures inside galactic nuclei. The Circinus disk in particular is so deeply buried in a jumble of stars, gas, and dust that no optical telescope can detect it. They estimate the disk contains enough mass to form perhaps as many as 400,000 stars like our Sun, were it given a chance. The Australian array picked up microwave signals from clouds rich in water vapor within both the warped edge-on disk and the outflow. The locations and velocities of the clouds provide strong evidence that the disk is channeling ejected material into two broad cones extending above and below the galactic plane. "Water masers have been observed in broad, wide-angle outflows in star formation regions within our Galaxy, but this is the first time they have been observed associated with the nuclear region of an active galaxy," said Simon Ellingsen (University of Tasmania), a co-author of the study. "These observations also are the first to show that this wide-angle outflow originates within about a third of a light-year from the galactic nucleus." A black hole is a massive object so compact and with such a powerful gravitational field that nothing can escape its pull once past the black hole's event horizon. 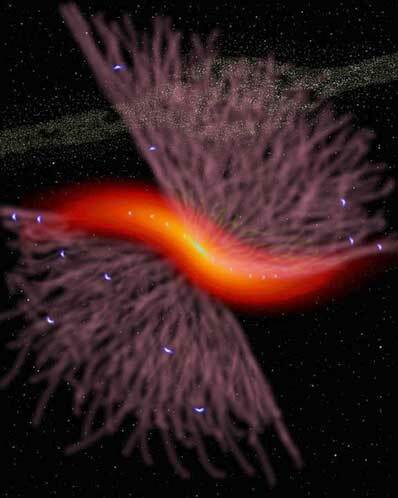 However, material can and does escape from regions near the black hole due to radiation pressure and inefficiencies of the accretion flow, among other things. The escaping material carries away angular momentum, allowing the remaining matter to fall into the black hole. The black hole in Circinus presents a stark contrast to other supermassive black holes whose outflows are channeled into long, narrow jets of material that blast out from the galactic nucleus. "In the center of the Circinus galaxy, we see a black hole that spews out gas and dust in a broad spray like clouds of vapor from a steam locomotive. This presents us with a paradox. X-ray radiation from the nucleus of Circinus -- radiation driven by the black hole -- is as intense as for black holes in other active galaxies. In that way, the Circinus black hole appears to be typical. However, while other black holes drive narrow relativistic jets of plasma, the Circinus black hole drives a comparatively meek wind - one that can support the formation of delicate molecules and dust," said Greenhill. Greenhill and his colleagues plan to continue studying the nucleus of the Circinus galaxy to investigate the mechanism responsible for generating the outflow. This research was published in the June 10, 2003 issue of The Astrophysical Journal.